What is YOGA? In short, yoga is a practice which seeks to unite the body, mind, and spirit through physical postures (asanas), breathing techniques (pranayama), and meditation. Yoga is not a religion, however it can be a spiritual practice. You don't have to be a member of any particular faith to do yoga, and practicing yoga does not mean that you are adopting any faith. Nothing in yoga goes against the teachings of any religion. In fact, yoga blends with every religious tradition, and people of every religious tradition do yoga. Yoga is about learning more about who you really are. Right now, you might think that you are your body. Yoga will teach you that you are not your body - your body is a tool that you've been given to help you realize who you really are. There's a type of yoga for EVERYONE. So even if you've gone to a yoga class before and decided it wasn't for you, try a different style of yoga or another instructor. It might be that you simply haven't found the type of yoga that resonates with you. This article from Yoga Journal lists the more common types of yoga, what they're about, and what to expect during a class. Maybe it can help narrow down a particular style that interests you. 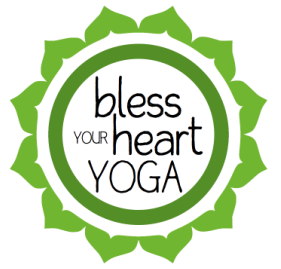 Classes at Bless Your Heart YOGA are taught in the Kripalu tradition. Emphasis is placed on body awareness, coordinating breath with movement, tuning in to the inner wisdom of your body, and following urges to move as your body directs. Guided relaxation techniques are incorporated to gently reduce stress and release physical & emotional tension. Read more about gentle yoga or chair yoga classes, learn how to practice safely, and discover the benefits of yoga, pranayama, stress awareness, and more on our articles page. Feel free to contact us with any additional inquiries. ﻿AVOID EATING FOR 2-3 HOURS BEFORE CLASS If you practice yoga on a full stomach, you might experience cramps or nausea, especially in twists and deep forward bends. The process of digestion can also sap your energy and make you feel lethargic. WEAR COMFORTABLE, SEMI-FITTED EXERCISE CLOTHING like bike shorts or leggings with a tank top or t-shirt. Layers allow you to regulate your body temperature by adding or shedding items. ARRIVE EARLY Getting to class 10-20 minutes early can help you settle in and align your attitude with the purpose of the class. While you’re waiting, you can practice a pose, do a few stretches, or just sit or lie quietly, breathe, and center yourself. TURN OFF CEL﻿L PHONE or switch it to vibrate mode. SPEAK QUIETLY IN THE PRACTICE ROOM Loud conversations can be distracting to yourself and others. We support and value the building of community, and encourage socializing quietly while in the practice room. CREATE AN INTENTION To help you focus, you might find it helpful to dedicate your practice to a certain intention. This might be to become more understanding, aware, compassionate, healthy, strong, or skillful. Or it might be for the benefit of a friend, a cause - or even yourself. ﻿STAY UNTIL THE END OF CLASS ﻿ Yoga is a holistic practice. Exercise brings blood flow away from organs to skeletal muscles. Relaxation brings blood flow back to the organs. Final relaxation and integration are important for healing, balance, and equilibrium.